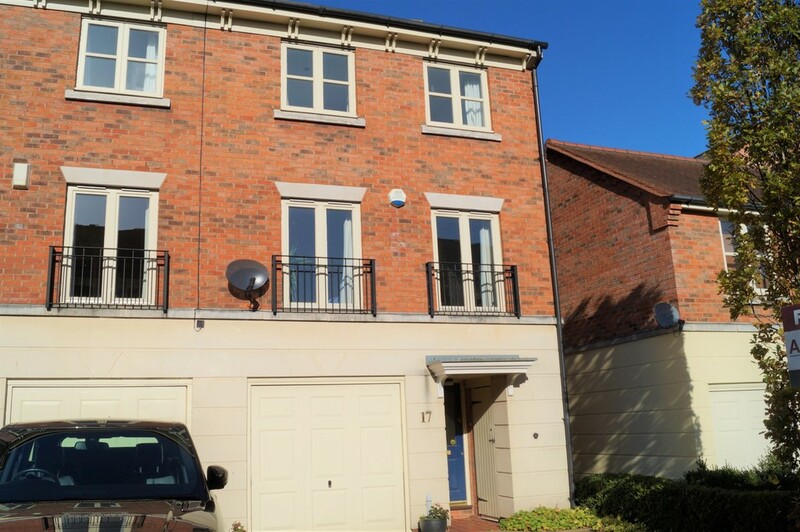 A spacious contemporary townhouse situated in the heart of the city centre with off road parking, garage & garden. NO ONWARD CHAIN. EPC - D.
EN SUITE SHOWER ROOM 7' 7" x 4' 1" (2.31m x 1.24m) Ceiling light, rear facing double glazed opaque window, radiator and partial tiling to walls. There is a three piece white suite to include shower cubicle, wash hand basin with pedestal and low level W.C.
UTILITY ROOM 6' 0" x 4' 6" (1.83m x 1.37m) A utility/laundry space that could be used as a kitchenette for the ground floor is required and having ceiling light, radiator, base and wall units with roll top work surface over, tiled splash back, stainless steel sink and drainer and space for washing machine, tumble dryer and under counter fridge. LOUNGE 15' 9" x 12' 9" (4.8m x 3.89m) A light and airy sitting room with spotlights, two front facing floor to ceiling double glazed windows, two radiator and feature electric fireplace. KITCHEN/DINER 15' 9" x 9' 6" both max (4.8m x 2.9m) Spotlights, ceiling light, two rear facing double glazed windows, radiator and wall mounted 'British Gas' boiler. There is a fitted kitchen with a range of base, wall and drawer units, roll top work surface, tiled splash back, stainless steel sink with mixer tap and drainer, integrated cooker and dishwasher plus space for an under counter fridge and freezer. GUEST CLOAKROOM Ceiling light, radiator, partial tiling to walls and a two piece white suite with wash hand basin with storage below and low level W.C.
EN SUITE SHOWER ROOM 6' 1" x 5' 5" (1.85m x 1.65m) Ceiling light, radiator, partial tiling to walls and a three piece white suite consisting of shower cubicle, wash hand basin with pedestal and low level W.C. BEDROOM TWO 9' 8" x 8' 4" (2.95m x 2.54m) Ceiling light, rear facing double glazed window and radiator. BEDROOM THREE 9' 6" x 7' 2" (2.9m x 2.18m) Ceiling light, rear facing double glazed window, radiator and built in cupboard. FAMILY BATHROOM 6' 7" x 6' 2" (2.01m x 1.88m) Ceiling light, side facing double glazed opaque window, radiator and partial tiling to walls. There is a three piece white suite to include bath, wash hand basin with pedestal and low level W.C.
GARAGE 16' 11" x 9' 1" (5.16m x 2.77m) Integral single garage with door from entrance hall, up and over door from driveway, light and power. OUTSIDE To the front of the property is a tarmac driveway. To the rear of the property is an enclosed garden benefitting from a particularly private outlook with initial patio, lawn with mature planted borders, shed and wooden gate providing side access. SERVICES We believe all mains services are connected. AGENTS NOTE We believe this property is available on a Leasehold basis however there is no monthly service charge and just a peppercorn ground rent. Please contact the agent for further details.